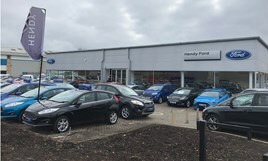 Hendy Group has expanded its operations in Crawley with the opening of a new Ford car showroom and the launch of a new Transit Centre. Hendy chief executive Paul Hendy said he was delighted to open the new facilities at Manor Royal which represents a £900,000 investment in the former Harwoods Jaguar Land Rover site. Work started in July, with a fit-out completed by Kiwi Design and the workshop fit out by Workshop Equipment Services, and resulted in the creation of a facility offering full service facilities for private and business customers alike. Paul Hendy said: “Crawley is an important and strong market for Hendy and we are thrilled to be investing here in the town. As part of the relaunch of Ford in Crawley, a new management team has been appointed with Wayne Backshall now new car sales manager at the facility. Chris Bacon is the used car sales manager and David Offer the service manager. In the Transit Centre, Adrian Couzens is the site manager. “Having the right team in place is hugely important and we are delighted to confirm the new management team at Hendy Ford and the key people for the Transit Centre,” said Hendy.